It was a cold and snowy night, what better to do than go for a delicious fish fry. I like it when the roads are slick and the weather is bad so we can go to a great dinner on Friday night and don't have the long wait at a popular establishment. Our friends arrived first and we were a little delayed because the roads were pretty bad. They arrived at 6:15 and our table was ready by 6:45, but we didn't arrive until 7:00pm. So when we arrived, our friends had to pass on the initial sating and wait for us. We ordered some brandy old fashioneds and chatted at the bar until our waitress came to take our order. The Black Otter is a classic supper club, so our order was taken at the bar and we were called to our table when our food was almost ready so we could enjoy the soup and salad bar. We all ordered specials so the soup and salad bar was included. Otherwise the salad bar al a carte is $8.95. But I have to say this is an impressive salad bar with many options and can be a meal unto itself, so it would be worth the price. Black Otter offers a variety of seafood options, and they are especially known for their prime rib. My friend got the queen cut prime rib, it was 32 oz of delicious goodness. It was cooked medium rare and they got it right, he also got some sauteed mushrooms on the side. Black Otter also has the 160oz prime rib challenge. If you can eat a full 160oz of prime rib, you get a t-shirt, your picture on their wall, and a gift certificate for a future visit. 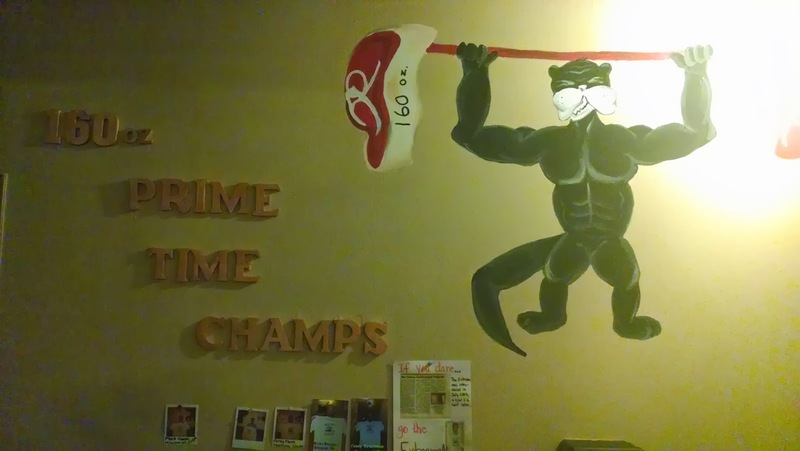 160oz is crazy big, but there are a good number of people pictured on their wall who did it. I got the lake perch, and one of our friends got the bluegill. The fish fry is on the pricey side at $16.95. The lake perch was cooked nicely and tasted really good, but I found the breaded to be a bit thick. For my potato, I got the potato puffs, they were ok, probably not something I would try again. One of my friends got the seasoned skins, which are listed as upon availability. They were absolutely delicious and my new favorite potato! I was disappointed that the meal was not served with any rye bread, and I even asked for some but none was available. Black Otter usually has at least an hour wait, but it's worth a trip to Hortonville to try their food. They may not be a Classic Wisconsin Fish Fry, but they are a classic supper club, and they know how to make and present delicious food. You must go! Rivers Bend has gone through some ownership changes over the last several years, and we've heard buzz about the reopening. We specifically heard about the Friday night seafood buffet and fish fry, so we had to check it out. We had 8 in our party so we called in reservations on Thursday night just to be safe, plenty of seating seemed to be available and reservations are not actually required. With a large party, I always call ahead to see if reservations are possible or necessary. We arrived on 6:45pm and the parking lot seemed full. We walked in and this establishment was large-with a large bar and large seating area. We checked in with the hostess and she said seating was available whenever all our friends arrived. We went to the bar and got immediate and friendly service. The brandy old fashioned was not muddled and made from a mix, they tasted like what you'd expect from a brandy old fashioned. So far so good. Once our full party arrived the host sat us at our table in the dining room. The ambiance of the room seemed dingy and did not look like it was under new ownership, rather just a reopening of the same old place. I noticed the stemware the water was served in was plastic. The waitress greeted us with a smile and asked if anyone needed drinks and proceeded to tell us about the Friday night specials; the seafood buffet for $26.99 or the perch plate for $12.50 (the Classic Fish Fry option), or the Fresh Breaded Lake for $15.99 and included the soup and salad bar. I expect better than plastic stemware for our water with those prices! The salad bar had some decent choices, including pasta salads, all the fixings for a good salad, two soups, and various cracker spreads including liver pate (but I thought the liver pate tasted more like braunschweiger). The salad I fixed for myself was good, and I opted for the seafood chowder as my soup, and it had a good flavor but tasted like it could be from a can. Some of my friends got the seafood buffet, and I have to say for $26.99 the buffet was lacking in options. There buffet was seafood only with a few types of shrimp, some form of whitefish, king crab legs, and shucked oysters with some potato side options-no meat options. The shucked oysters were not good, in my opinion you can't serve shucked oysters on a buffet without having them properly packed with ice, and I don't think it's possible to serve good shucked oysters buffet style where they sit out for a lengthy period of time. I think it was an attempt at an upscale buffet but it misses the mark. I don't think the buffet is worth the hefty price of $26.99. We received our entrees quick enough and I wasn't impressed with the sparse presentation. 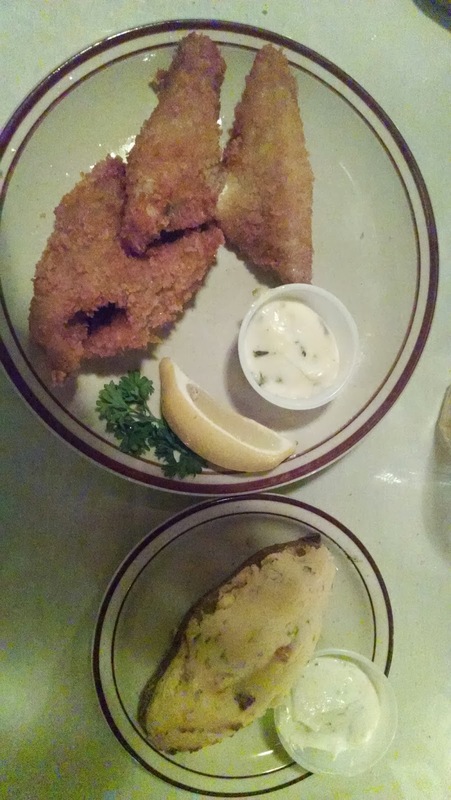 I got the Fresh Breaded Lake Perch for $15.99 and it came with a paltry two butterfly filets of perch. The perch was a little bit overbreaded with panko breading, so it was thicker and crunchier than I am used to. I would say the perch was ok. For my side I chose the twice baked potato and the waitress assured me it was made with real potatoes. It was served in a real potato skin and tasted pretty good. I think it was real, at least it tasted good. Because I got the more expensive perch option, it came with the salad bar but did not come with a side of cole slaw or the rye bread. It was my mistake, but I don't think the extra price is worth it if you're looking for a Classic Wisconsin Fish Fry. The salad bar alone was $3.50, not worth the price given the standard options. I can't say I'd recommend this place to my readers. Plastic water glasses, overpriced and limited choices on the seafood buffet, sparse pieces of overbreaded and overpriced perch, need I say more. While it is technically a Classic Wisconsin Fish Fry, they need to try harder and do better. 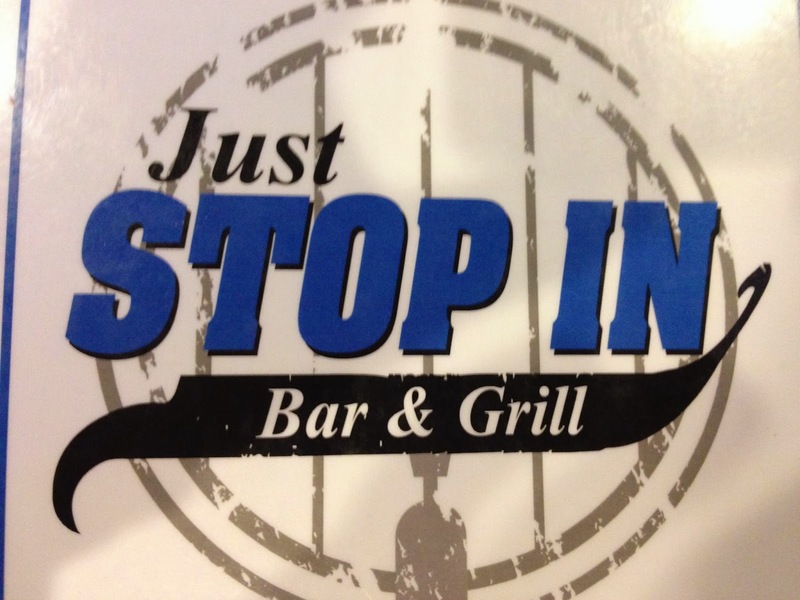 Just Stop In is a dive bar in De Pere right on Highway 57, just north of Greenleaf. It's a local hang out and we heard it had great food. A friend posted on Facebook she was going to a fish fry so I posted if she'd mind if we came along, she agreed and we decided on Just Stop In; it's been on my short list for a while. 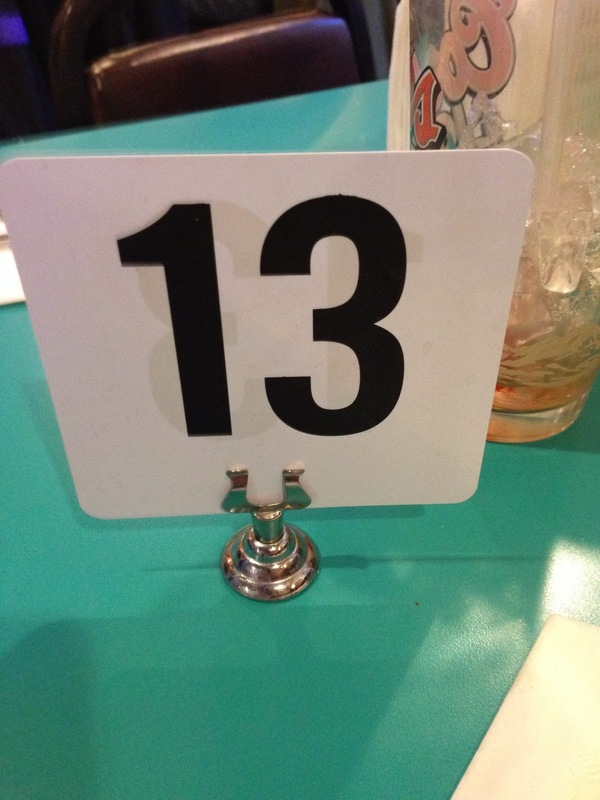 We arrived around 6:30, and our friend had already put in our name for a table for three, so the wait wasn't that long. Being a local bar, I knew some people at the bar, and the bartender is my brother-in-law's sister. Gotta love local bars where you know most of the people. We got our brandy old fashioned doubles quickly, it's good to know the bartender. The host sat us at table 13, and a waitress soon followed with menus, a simple one sheet laminated menu with a special section for fish. The tables were sort of a seafoam green color and placed throughout the dining area not too far from the bar; a little old school feeling but they weren't looking to impress with the seating as they were with the food. Before we ordered our main course, we opted for the beer battered curds. As we waited for our curds, we placed our orders for the main course. We were delightfully surprised when the curds arrived because they were fried with bacon...YUM! They were probably some of the best cheese curds I've ever had, but what isn't great with bacon, right? We devoured the curds and enjoyed every last bit of fried curd and bacon, a generous portion. Our food arrived next. Before me was placed a plate of perch with all the sides I expected. The perch was lightly breaded and fried perfectly. I loved the batter they used and you could see fish through the batter, a visual test to tell if it is over-breaded. There were several potato options, one being ranch mashed. I ordered those because they sounded good, and the waitress assured me they were real potatoes. I'm not sure if they were real or not, but I think they were real, but possibly pre-packaged. I should start asking whether the potatoes were hand peeled and boiled and mashed and not reconstituted. They were tasty nonetheless. The perch was served with a side of coleslaw in a small cup, and it was good. The dinner was presented with two pieces of buttered rye bread placed on top of the perch. There was no white raw onion so I asked the waitress to bring me a slice on the side. 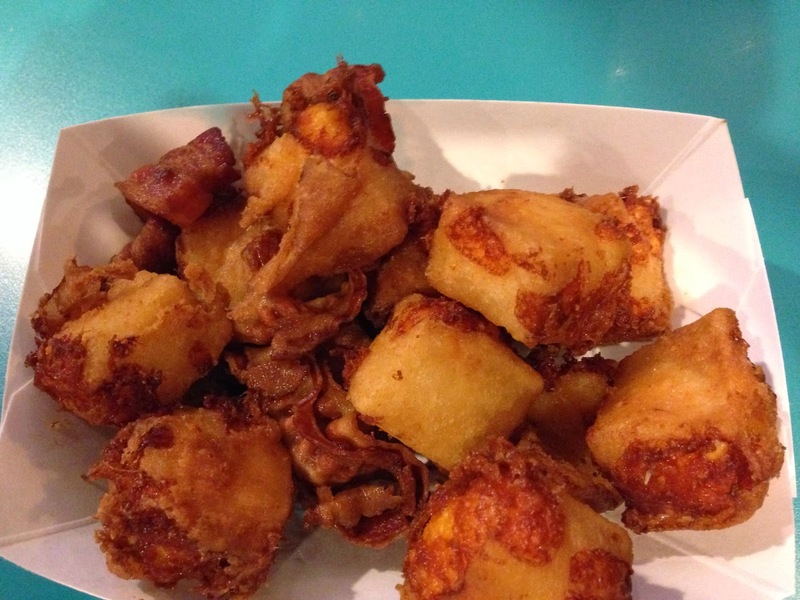 Our meal was great, and I absolutely loved the beer battered cheese curds with the bacon twist, truly delicious. Looking for a local "dive bar" fish fry at a good price, great food, and the local atmosphere? 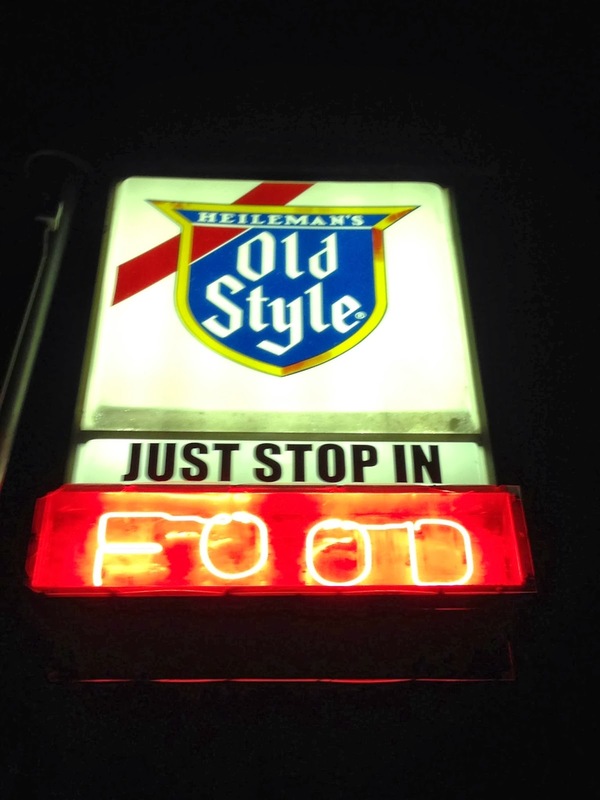 Just Stop In is the place to be...so just stop in for a good drinks, conversation, and a mostly classic Wisconsin fish fry. 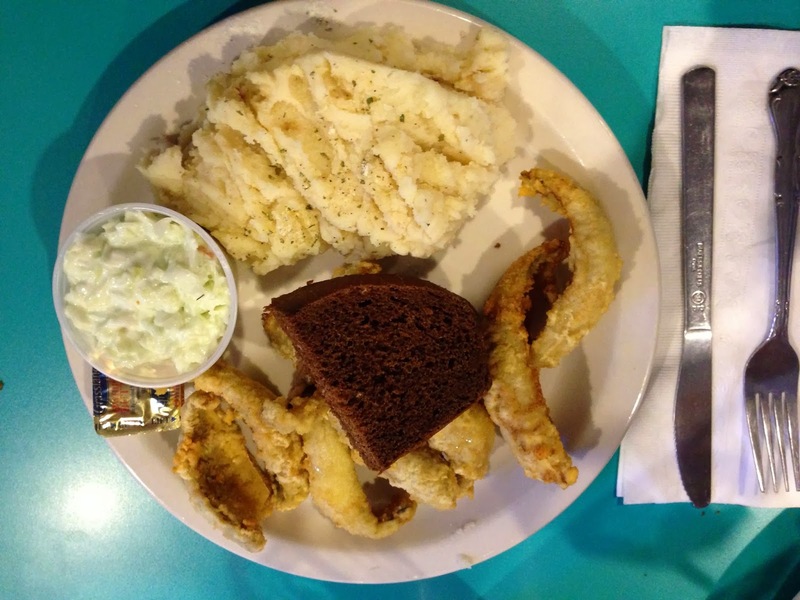 On December 17, 2012, we started our journey for finding the best Classic Wisconsin Fish Fry's in Northeast Wisconsin. Thank you to all my readers for your support, feedback, and recommendations. I'm looking forward to finding more great places to dine in the new year, so keep your suggestions coming. I'm hoping to dig in and do some more research on commonly asked questions like why the white raw onion with rye bread, the origins of the Classic Wisconsin Fish Fry and many more. Stay tuned. Wishing you a Happy New Year!